Across the country, alleys that were once backdrops to crime or littered with trash bins are becoming colorful expressions of neighborhood character. With alley activation programs like Art This Way in Fort Wayne, northeast Indiana is no different. The spaces between buildings that were once neglected are becoming centers of attention. But why alleys? The question points back to national studies, like a 2011 report by graduate students at the University of Washington, which found that about 85 percent of downtown Seattle’s alley space was underused. It estimated that reinvigorating the city’s alleyways could increase its total public space by 50 percent. So walkable alley's help cities better utilize their space. On top of that, clean alleys improve a community's overall quality of health. City Lab reports that “the proliferation of trash and flooding in alleyways has come to be seen not only an aesthetic blight, but an environmental one.” Therefore, efforts like the Chicago Green Alley Program have paved the way for cities to improve flooding and trash disposal in their urban cores. Now smaller communities across northeast Indiana are using alley transformations as a simple way to reinvigorate their downtowns, advance green initiatives, and better utilize public spaces, too. Just ask Wabash, where efforts to revitalize the Market-Canal Alley have played a critical role in earning the town of about 10,000 national attention for its placemaking work. 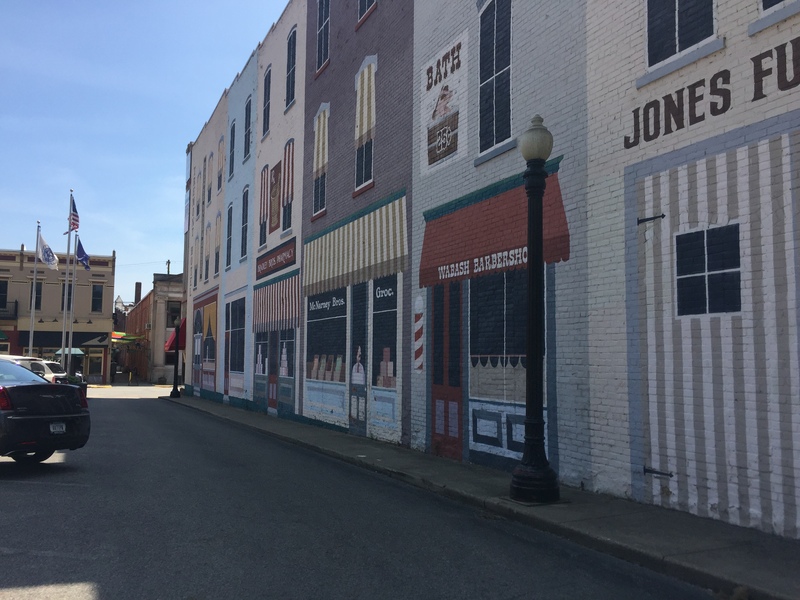 Murals decorate downtown Wabash leading up to Market Way. Tyler Karst is a Project Coordinator for an organization called Wabash Marketplace, Inc. (WMI) in downtown Wabash. Since 1981, the 501c(3) nonprofit organization has led the charge of fostering community and economic development downtown with engaging, creative, and inviting public spaces. It sponsors events like First Friday Wabash and the Wabash Farmers’ Market with funds from businesses, individuals, and the City of Wabash. But the organization saw that a critical connection to two hubs of cultural activity in the area was missing. The Market-Canal Alley, which offers an easy pedestrian shortcut from Canal to Market Streets, was an eyesore in disrepair, Karst says. The asphalt was old and didn’t have proper drainage. Consequently, it did not position the city in the best light, and it was a missed opportunity to connect key points of interest in an interesting way. Market Street is home to many local businesses in downtown Wabash. 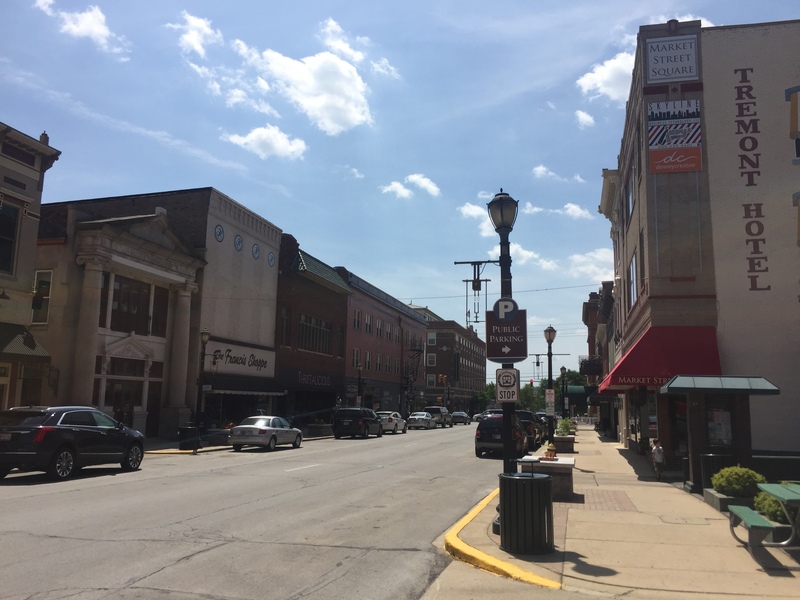 To clean up and better utilize the space, both public and private entities in Wabash weighed in on the project and pledged their support for it. The end result was a small change that made a big difference. According to a report from WMI, “the vision was to activate the space by adding lighting and visual interest." A cable system was installed to support both the lights and other installations throughout the calendar year, such as colorful lanterns, snowflakes, banners, shade sails, and metal sculptures. This has allowed the alley to be more of a destination, with the additional benefits of benches and landscaping. Since the revitalized alley was presented to the public as the Market Walk in 2015, Karst says the community has responded well to it with a palpable sense of local pride. It’s just one example of how alleys are being transformed into vibrant public spaces right here. Art This Way is hosting an Art Crawl Sept. 21, 2018, from 5 p.m. – 9 p.m. The Art Crawl will be held in five downtown locations. Each location will feature a live band, an artist performing live, free appetizers, a cash bar, and a gallery show.